I love when books contain recipes that go along with the story. This was a great one! My kids and I are huge readers, and when it comes to history, all five of us, my husband included, are big fans. We all love to cook and bake, so when my daughter found a historical fiction book about the life and times of a girl during World War II, she was excited to read it. 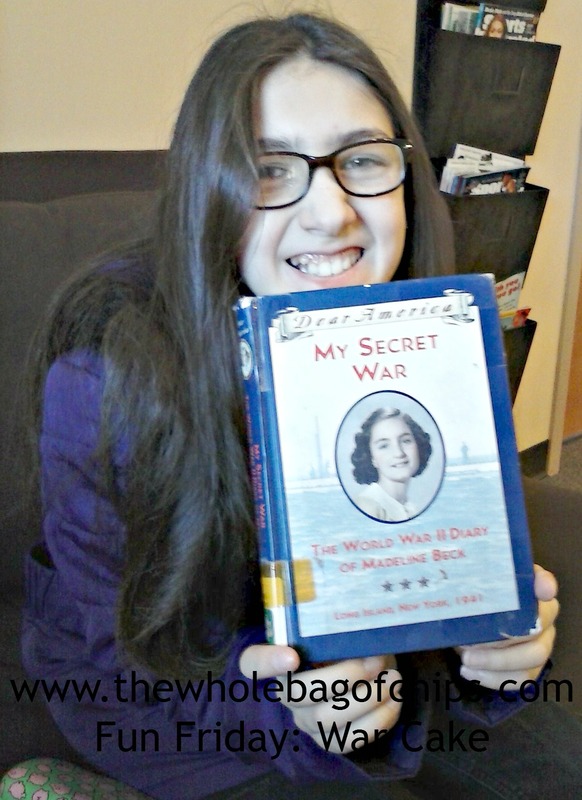 “My Secret War: The World War II Diary of Madeline Beck” is part of the Dear America series of books. 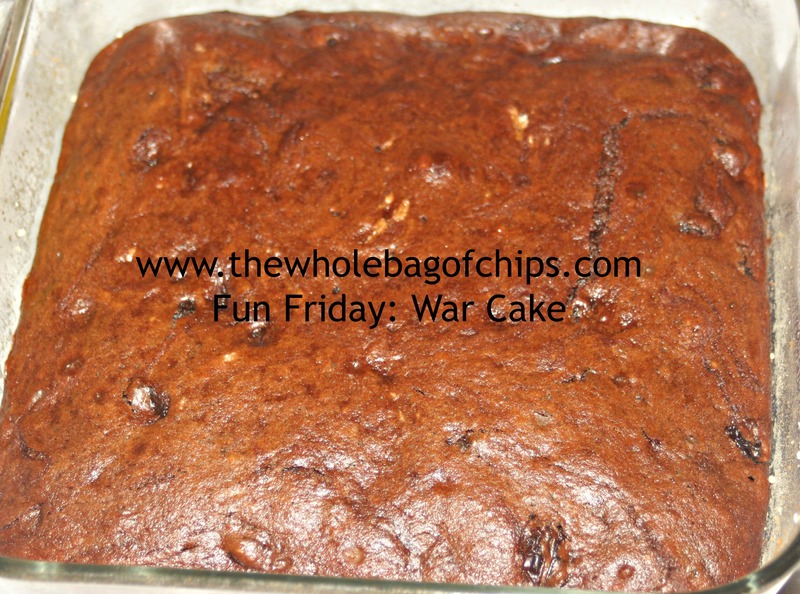 At the end of the book there was a recipe for War Cake, something that was spoken about throughout the story. She was so excited! We had to make it. I looked at the ingredients and we had them all. Well, we had almost all of them. The recipe called for walnuts and I don’t love them so we don’t often have them here. I came up with a great substitution though: chocolate chips! Everything goes well with chocolate chips. This was an excellent book and the recipe inside was a bonus! We decided that on Sunday afternoon this would be a great recipe for her to make. Looking at it further, I realized that it was ultimately pretty healthy too, as far as cakes and desserts go. Due to the fact that ingredients were hard to come by during World War II, this cake is made with brown sugar rather than white, no eggs, no milk, and only a little butter. My daughter learned in the story that white sugar was used to make gunpowder during the war and therefore, was almost impossible to come by. Although the character in the story is fiction, the events are based on true historical events during WWII and are based on the author, Mary Pope Osborne’s own parents’ experiences as well. Mary Pope Osborne is also the author of the popular Magic Treehouse series of books. I know that my daughter will be returning this book to the library this weekend during our weekly Saturday visit and she’ll be on the lookout for another Dear America story to read, since she devoured this one. Until then, here’s the recipe for Mary Pope Osborne’s War Cake. Preheat the oven to 350 degrees. Grease and flour an 8×4″ baking pan (we used 8×8). Place the brown sugar, water, raisins, margarine, cinnamon, and cloves in a heavy-bottomed saucepan and bring to a boil. Turn down heat and cook gently for 5 minutes. Remove from heat and let cool until mixture is lukewarm. Add flour mixture to the cooled sugar mixture, beating until the batter is smooth. Stir in the walnuts (or if desired, chocolate chips). Spread evenly in the baking pan and bake for 25-30 minutes or until a toothpick inserted in the middle comes out clean. Let cool in the pan 10 minutes, then turn onto a rack to cool completely.